After being in the US mail limbo for 22 days after it shipped, I finally got my Zagg Invisible Shield for my iPhone 4. There's also a green bumper from Apple on the phone. There's also a clear one on the front. I'm pretty happy with how it turned out. It actually looks better in real life than it does in the photo above. You never know how vivid the colors are really going to be when they print it. It's made out of the same material they put on the leading edge of helicopter blades to prevent abrasion from sand and dust. It's a custom design, I made it in photoshop. 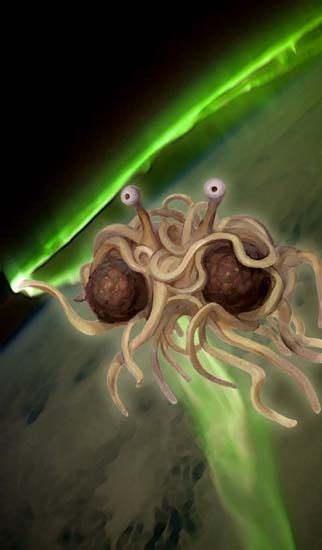 I took a picture of the Flying Spaghetti Monster from Venganza.org. The background came from NASA, it's a photo of the Aurora Australis (Southern Lights) as seen from the International Space Space Station. 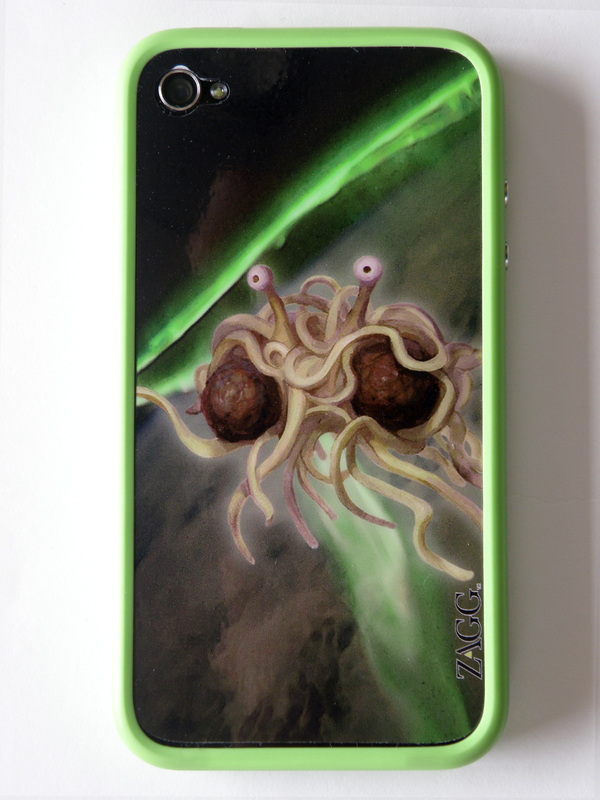 Here's the original pic I sent to Zagg to make the skin. That is awesome! I hope you've sent the photo to Bobby to post on the venganza site. @ Linda: No I haven't, but that's a good idea. I was featured on the Venganza site when Wells Fargo denied my bank card design. Nice photo. It looks like an octopus. Nice effect. Are there any available skins for iPad too? Just like this skin. @ iPad Skins: Yes, I believe you can submit a custom design for iPad or iPad 2 skins on Zagg as well. This iPhone 4 Skins is really amazing I love the design. I'm going to have one for my iPad. Hi there! Graphic Design will be interesting and fun to do specially if you are a person that is naturally creative thinker.